You are here: Home / Blog / 10 Reasons Why the Hypnobirthing Australia Course is THE BEST Hypnobirthing Course! 10 Reasons Why the Hypnobirthing Australia Course is THE BEST Hypnobirthing Course! We know how important it is for you to have the best, most comprehensive, up-to-date and professional hypnobirthing education in preparation for the birth of your precious baby. So it is time for us to put our modesty aside and be completely frank with you; because by keeping quiet about the important differences between our modern Australian program and others in the market, we are doing YOU a disservice. The Hypnobirthing Australia program is, without a doubt, the BEST hypnobirthing course available! We make no apologies for not being ‘one size fits all’. We do not claim to be a self-proclaimed ‘institute’ for international hypnobirthing. We are very proud to be a professional, Australian educational standards childbirth education program created specifically by Australians for Australians – and we know that we have the best quality program available for your preparation for a beautiful, calm and positive birth. 10 Reasons Why the Hypnobirthing Australia Program is THE BEST (plus an extra 11th reason due to some recent research just released)! The Hypnobirthing Australia program has been developed by a tertiary qualified, experienced registered Educator and Australian registered Clinical Hypnotherapist who has recent, personal experience using hypnobirth techniques for her own three births. It is important that we keep with the times and combine our knowledge of recent research/scientific advancements with the birthing wisdom of the years – to ensure that we have every advantage in our preparation for a safe and positive birth. We remain up-to-date and relevant to modern Australian needs. The quality of the professionally compiled course and training materials provided are second to none. Parents often exclaim that the materials have far surpassed their expectations and are some of the most comprehensive and professionally presented materials they have ever received in a training course. There are no 20 year old birth videos shown in our classes! In addition to outstanding face-to-face tuition by your highly trained hypnobirthing practitioner, you are provided with a complete professionally printed folio of resources and additional downloadable practice albums, eBook, video tuition and ongoing support. Let’s just say that we like to ‘over-deliver’ when it comes to your training materials – and so we offer fantastic value for money. The Hypnobirthing Australia course is recommended by obstetricians, hospitals, midwives, health and childbirth professionals nationally. This Australian program is taught in hospitals, birth centres, private childbirth education classes and also through Aboriginal Health Services. We are an Australian company, supported by Australian birthing professionals and proud to be providing the highest quality of education to Australian families. The Hypnobirthing Australia program incorporates the wisdom of renowned childbirth experts from Australia and the world. Unlike some programs, it is not written from one individual’s perspective. The Hypnobirthing Australia course is a collection of knowledge and wisdom from throughout the world and ages, packaged together in an easy to follow, professionally designed program for the modern mother and birth partner. We are up-to-date and inclusive. Our focus is on achieving a POSITIVE birth experience (rather than some other courses that are so geared towards a ‘natural birth at all costs’ that they can incite fear in mothers who do sometimes require medical assistance). We are open and forthright about the intensity of childbirth and do not teach unrealistic expectations of labour and birth. Our course incorporates movement, touch, vocalisation, hypnotherapy, visualisation, breathing, mother-directed ‘pushing’ and other techniques as well as preparing parents for a range of possible scenarios during labour and birth. We are pro-active and informed in our preparation for birth. Hypnobirthing Australia even created the world-first hypnobirthing course specifically designed for caesarean birth. Our courses truly prepare parents for a positive birth experience and that is why so many childbirth professionals recommend our course over others. Our extensive range of hypnobirthing mp3 practice albums are all professionally recorded, by a voice trained professional, in an Australian accent. It is very beneficial for Australian mothers to have such a comprehensive selection of quality hypnotherapy albums, in a familiar accent, to use through pregnancy and birth. Our albums are very popular throughout the world – but they are created here, in Australia, for you. Our practitioner training is of the highest standard in Australia and taught by the director of Hypnobirthing Australia, Melissa Spilsted, who is recognised as Australia’s leading expert in hypnobirthing education. Melissa possesses over 20 years of combined experience and tertiary qualifications in creating and presenting educational programs. In addition to this, she is a registered Australian teacher, childbirth educator and fully registered Clinical Hypnotherapist with the Australian Hypnotherapists Association. Our Practitioners are the best of the best. We have very strict requirements for practitioner training and ongoing certification (much more stringent than other hypnobirthing training courses – we are extremely selective in who we accept in our training); as Hypnobirthing Australia is focused on quality, rather than quantity. We have Australian standards, a Code of Conduct, an Australian based register. When you book into a Hypnobirthing Australia course you can be assured that you are receiving the highest level of hypnobirthing teaching, course and training materials in the country. The Hypnobirthing Australia course is flexible and designed exclusively for modern Australian families. We are a committed group of Australian childbirth educators and we KNOW what a difference quality positive childbirth education can make to your birth and life. Our passion for excellence, flexibility and quality in childbirth education, drives us. We are not some international company trying to be ‘one size fits all’ and suit every country’s maternity system and culture. The Hypnobirthing Australia antenatal course is tailor-made for Australians. We have face-to-face, Skype and online options available. Whatever your needs, we have the flexibility to help you to meet them; and we are very proud to serve you! The Hypnobirthing Australia course is already tried, tested and LOVED by THOUSANDS of Australians. Read the hundreds of testimonials on our website. You also may have seen us featured in the press, on leading television programs such as Channel 7 Sunrise, the ABC, or in popular parenting magazines such as Mother & Baby and Practical Parenting magazine. We are Australia’s fastest growing childbirth education course and often recommended by both professionals and parents. Why? Because our program is down-to-earth, up-to-date, the highest quality and to put it simply, it just works! LATE ADDITION. Sorry, we had to add in an 11th reason due to recent Australian research being released that shows that quality, independent childbirth education that incorporates breathing, visualisation and other relaxation techniques dramatically reduces interventions (such as almost halving need for epidural and caesarean section). 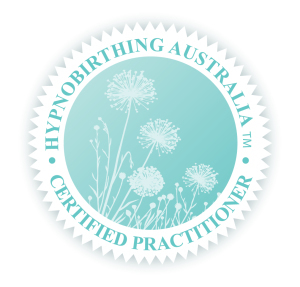 Please make sure that you check the directory in the Hypnobirthing Australia website to guarantee that you have booked into a Hypnobirthing Australia course with a certified Hypnobirthing Australia practitioner (look for the original authentic blue seal on websites to verify that you are booking into a certified Hypnobirthing Australia course). We think that all childbirth education programs are doing a wonderful job in spreading the word of positive birthing, however not all courses are created equal. Sometimes claims are made that can be misleading and we feel that it is important that Australian parents know the facts when booking into a hypnobirthing course. Ensure that you start this journey off with the BEST hypnobirthing childbirth education available – because you and your baby DESERVE nothing less than THE BEST.